A committee organizing a ceremony for the new USS Vermont submarine has collaborated on a special-edition stuffed animal with the Vermont Teddy Bear Company. 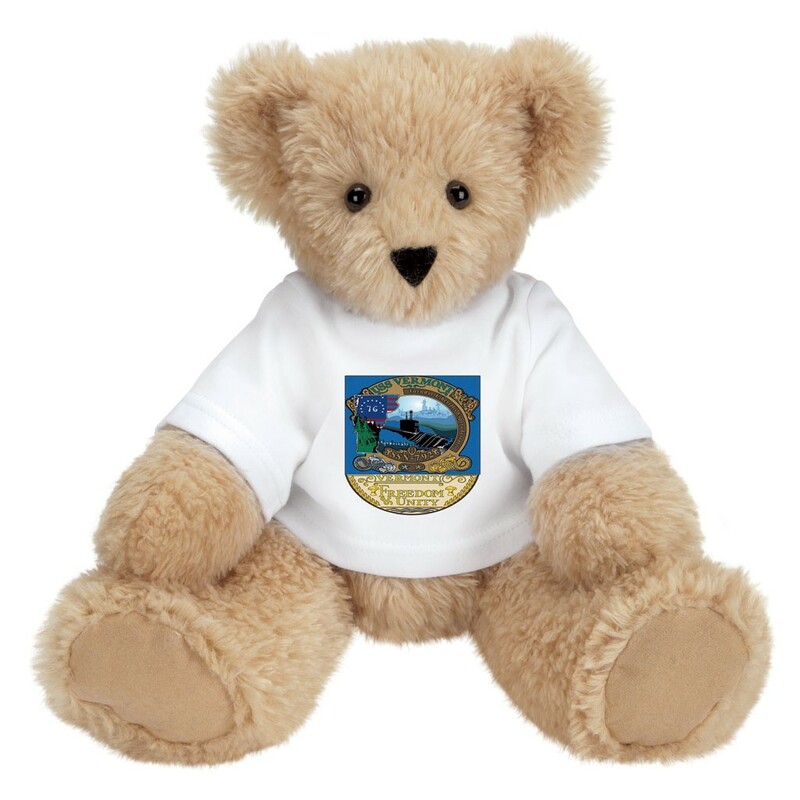 The Dewey Bear, named after Montpelier-born Admiral George Dewey, comes in two colors and sizes, and the bruin's shirt bears a special logo commemorating the Virginia-class fast attack sub. A portion of the proceeds will help fund the sub's commissioning ceremony, which is set to take place in spring or summer of 2020, according to commissioning committee member Bill Moore. That's when the shipbuilders at General Dynamics Electric Boat in Groton, Conn., "basically turn the keys over to the Navy and give the Navy the newest ship in the fleet," Moore said. "I've been to a lot of these commissionings and christenings and launchings, and they're steeped in military tradition," he said. "They really make you proud to be part of the process, but also, it makes you proud to be an American." Gov. Phil Scott and U.S. Rep. Peter Welch (D-Vt.) both attended the sub's christening at the Connecticut shipyard last October, when ship sponsor Gloria Valdez, former deputy assistant secretary of the Navy, smashed a ceremonial bottle of sparkling wine on the $2.7 billion nuclear-powered sub. It's currently undergoing testing before the commissioning, according to Moore. It'll be the third Navy ship named Vermont. The first was a 74-gun warship that launched in 1848, while the second plied the seas during president Teddy Roosevelt's administration, Moore said. Other ships have paid tribute to the Green Mountain State with names such as Burlington, Montpelier and Ethan Allen. Though the newest vessel will never make it to Vermont, Moore said he sent 15 gallons of Lake Champlain water to pour over the sub before it even enters the ocean. And he attempted another Vermont twist on the formal process. "I tried to convince them, instead of breaking a bottle of champagne on the ship when they christened her, they should have smashed a bottle of maple syrup," Moore said. "The Navy said no, tradition is tradition." The original print version of this article was headlined "Bear Necessity"